Once in a week, I shop at Farmer's market which is next to my son's piano school. I love taking him to the class as I get to shop at farmer's market. Last week I happened to see the Foxtail Millet in the grain section of the store. I grabbed a pack just to have a taste of it. When I was as a kid, I had seen the farmers who worked in my Grandma's farmlands used to have Thinaimavu a power packed sweet, Kambanchoru (Pearl Millet)..that are cheap alternatives to rice. Foxtail Millet is a nutrient packed grain which is naturally mild sweet and nutty flavor gives lot of energy to the farmers who work from dawn to dusk. I read that a group of people who lives in the peak of Himalayas called Hunzas whose life expectancy is normally hundred and above include Millet as their staple diet. Typical Hunzas Bread is made of Millet flour. When I brought it home, my mom cherished her memories of her father whose favorite snack is Thinaimavu Urundai. 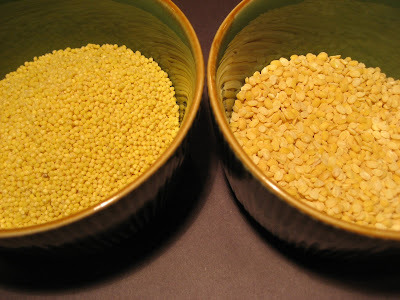 But my mom had never made any dishes at home with Foxtail millet. I wanted to make an item that everyone prefers in my home. Starting from my son to Mr. B, everybody loves venpongal. 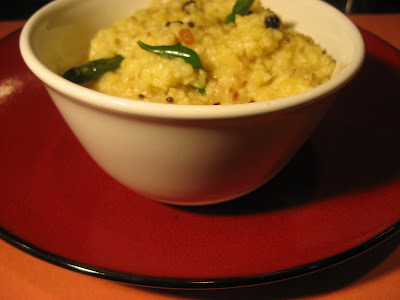 I fixed myself to make pongal with Foxtail Millet and Moong Dhal. It came out really well and needless to say not even a single morsel was left in my son's plate. Dry roast moong dhal in a pan till the aroma comes out. Make sure you don't brown them. 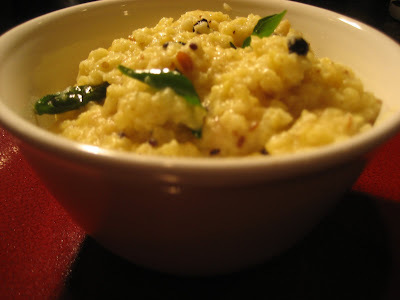 Wash the millet once or twice and combine with moong in a pressure cooker. Give a quick saute to the chilies and ginger and add it to the cooker. Add salt, ghee and water and cook it over medium flame for one whistle. Reduce the flame and cook for 3 more minutes. Switch off the Gas. Fry some cashews, curry leaves and whole peppercorns and add it to the Pongal. Sprinkle the coarsely ground Jeera-Pepper powder and give a gentle toss to the pongal . Thanks to my friend who corrected me to mention the specific millet name as millet in general refers to small-seeded species of cereal crops or grains cultivated for food and fodder(Animal feed). I used foxtail millet(Thinai) to make the above dish. can u please get the recipe for Thinaimaavu urandai from ur mom? Hw is the shape of grain?i hav this millet and when i cook till its soft the outer shell breaks off.the inner portion remains soft and the outer portion remains chewable husky nature.do i hav to dehusk again?the grain is oval in shape.